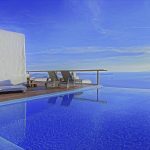 Enjoy a spectacular retreat to beautiful Villa Farrah, a stunning luxury villa in Mykonos that oozes charm and style. 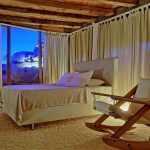 With five modern and stylish bedrooms, this beautiful villa can sleep up to ten guests in total comfort. Villa Farrah effortlessly weaves traditional charm and modern style; something which is apparent from your first glance at the property. Utilising traditional design features, the villa oozes classic elegance with its natural finish that complements its beautiful surroundings. Stepping inside, the luxury villa is sophisticated yet warm and approachable. Natural textures and light, airy tones ensure that the property is inviting and charming, with tasteful nods to its seaside location and handcrafted furniture. There are a number of warm shared living spaces, including an inviting lounge room with a fireplace. There’s also a separate dining area and kitchen for preparing meals to enjoy with your group. Large windows allow for the natural light to stream in, and frame the spectacular views. With just a few steps, find yourself in the enchanting outdoor area of Villa Farrah. 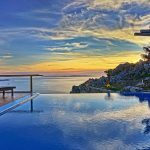 A dazzling infinity pool overlooks the jaw-dropping panoramic views, tempting you in for a swim or perhaps to do some sunbathing nearby. 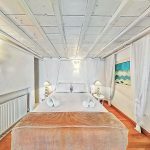 There’s also a romantic canopy sunbed and swing for enjoying romantic days in the dazzling Mykonos sun. Or, perhaps you’d prefer to make use of the barbecue and enjoy a delicious dinner while overlooking the pool and sea. Villa Farrah is certainly an entertainer’s delight, with ample space for events and gatherings. At the end of each day in paradise, retreat to one of Villa Farrah’s beautifully appointed bedrooms, each with its own ensuite. 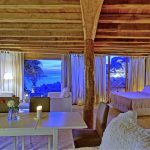 All of the bedrooms enjoy large windows and views of either the garden or the sea, and each is modern and stylish with a hint of romance and charm. Villa Farrah enjoys an enviable location in Kastro, one of Mykonos’ most sought-after areas. 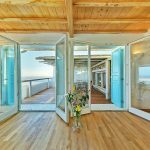 It offers both privacy and convenience, being located in a secluded location that is close to both the beach and the amenities of Mykonos Town. 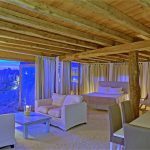 For your peace of mind, this luxury villa in Mykonos boasts a start of the art security system, and there is also room for secure off-street parking if you are travelling with your own vehicle.